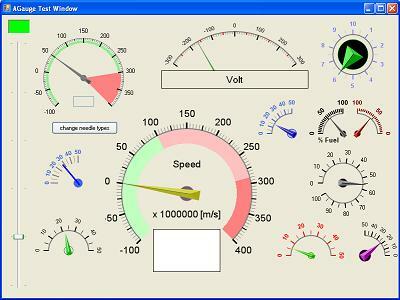 Properties for gauge label (previously known as CapText) and range are grouped into GaugeRanges and GaugeLabels which allow us to create any number of range and label as we wish. 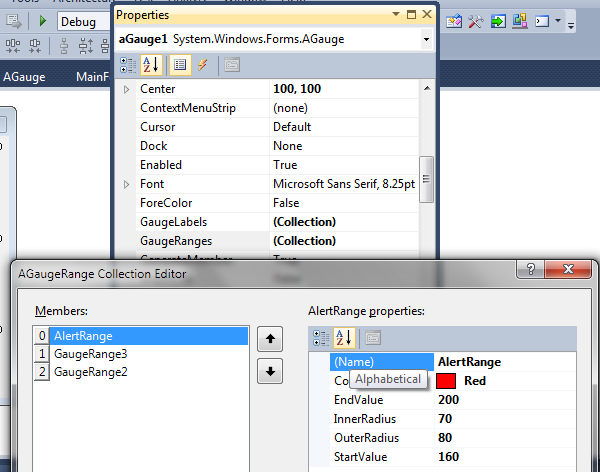 Range and label can be edited either from code or using the collection editor from the properties window. Besides, each label can use different Font settings since label is an instance of AGaugeLabel. AGauge control has 2 different type of needle design selectable from NeedleType property. Type of NeedleType property waschanged from Int32 (0 or 1) to enumeration type (NeedleType.Advance or NeedleType.Simple) to avoid invalid entry from user. ValueInRangeChangedDelegate was changed to ValueInRangeChangedEvent to allow multiple subscriptions. The event is changed to trigger only if value is entering or leaving a defined range. Besides, ValueInRangeChangedEventArgs was updated to hold current range and gauge value. /// Event argument for <see cref="ValueInRangeChanged"/> event. /// True if value is within current range. ValueChanged event is added to notify user whenever gauge value is updated. Note that attempting to set gauge value out of defined gauge range will not trigger this event.